This essay was first published by Ethical Corporation magazine. Climbing Borneo’s Mount Kinabalu is hard work. Climbers are legally required to hire a guide. Not that it always helps: guides sometimes just abandon the tourists and climb with each other. Why wouldn’t they? – there’ll be a fresh batch of tourists tomorrow who will be obliged to give them money. When I went up the mountain, I was lucky: the guides supporting my group stuck with us, even on our incompetently slow descent. They even missed their village football match for us. Why did they care? Probably because I was travelling with Intrepid Travel, a global ‘adventure tour’ organiser which takes loads of groups to Borneo. Intrepid Travel has given generously to the guides’ village, supporting teaching programmes and providing learning resources. Clever: the villagers value their good relationship with Intrepid, and consequently the guides look after Intrepid’s clients assiduously. Is Intrepid’s work in that village ‘charity’ or is it ‘investing in the business’? It’s both. Great corporate philanthropy always is. One of the best examples of corporate philanthropy is from Goldman Sachs, an investment bank. It’s probably the first heart-warming tale from the world of high finance you’ve heard for a while. Globally, we lose 2.3m children each year to preventable diseases such as pneumonia, diarrhoea and yellow fever. Various governments pledged money for developing and delivering immunisation, though the timing of their funding is unpredictable. Goldman Sachs provided a small group of bankers on a pro bono basis to create the innovative International Finance Facility for Immunisation (IFFIm) for the Global Alliance for Vaccines and Immunisation (GAVI), a charity. This takes the governments’ commitments and, by issuing bonds secured against them, makes the money available up-front. This enables GAVI to plan better, which accelerates research and development, reducing vaccine prices and speeding delivery. Vaccinations enabled by the bond are expected to protect more than 500m children in about 70 of the world’s poorest countries, and the bonds themselves are credited with saving at least 3m lives[ii]. Let’s suppose that this project occupied three bankers for two years, i.e., took six person-years. The cost of that time (even the opportunity cost) to the bank might have been, what, a few million dollars? Saving three million lives – three million pointless pregnancies, three million risky births, three million incidences of grief – is a cracking return on a few million bucks. A couple of dollars per life: it’s rather humbling really. Goldman Sachs only got that return by using its virtually unique skills in financial wizardry: it would never have got that by dishing out cash. More than ‘just’ altruistic, the bond has been good for Goldman itself. Good for morale: ‘The opportunity to marshal the resources of Goldman Sachs to help improve the lives of millions of children is profoundly meaningful,’ says Michael Sherwood, co-CEO of Goldman Sachs International. And good commercially, since Goldman Sachs is one of several banks which sell the bonds. It’s been criticised for this – though not, I notice, by any of the half a billion children. Contrast that with a recent giving programme by NatWest, a retail and wholesale bank. It invites charities to apply to its CommunityForce programme, and those which gather the most votes on CommunityForce’s website get grants of £6,000. It gives ~£2.5m each year: about the same as Goldman Sachs’ ‘donation’ to immunisation. Yet CommunityForce achieves much less: its ‘winners’ are chosen on popularity, and since there’s no connection between that and merit (consider a great charity working with homeless people, who generally aren’t online), may not be much good. The application process is very labour-intensive for charities. NatWest solicited loads of applications of which it rejected 93%, so it created masses of wasted work. And the £6,000 grants at the end of all that are ‘restricted’ (i.e., ring-fenced) which demonstrably reduces their value. 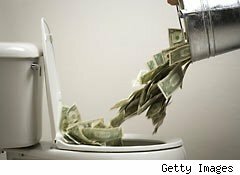 One bank uses a few £m in such a way that it saves millions of lives, changes an industry and creates a market; another uses it in such a way that it creates virtually no meaningful help and lots of waste. What are your resources and context? They include skills, passions, interests, experiences and values, as well as funds, contacts, software, equipment and premises. A company’s context includes the concerns and requirements of staff, the board, shareholders and external stakeholders, as well as competitors and regulators. What needs doing in the world? This means the priority needs in the world (which we could think of as demand), and what’s already being done by other charitable donors, businesses and government (which we could think of as supply). On the right-hand side of the diagram are the needs in the world which need addressing, and which haven’t been met by businesses, government or NGOs to date. Clearly, programmes should always target priority problems – ideally problems identified as problems by the beneficiaries rather than solely outsiders – and select their NGO partners on merit. On the left of the diagram, a company’s resources include staff, offices, brands, teams, distribution systems, warehouses, training programmes, relationships with accountants, systems, information, knowledge of government, and so on. The aim of making best use of the available resources is precisely analogous to comparative advantage, and so it’s surprising if giving cash to another organisation is better than using any of the company’s bespoke resources and capabilities. As Kurt Hoffman, then Director of the Shell Foundation observed, ‘Money is the least valuable social change asset’. (1) If giving creates value for the company. It might increase sales, decrease costs, hone skills, bring reputational benefits, improve customer service by getting tired clients down the mountain safely, improve skills in the pool from which the company hires staff, improve morale. Given that companies are spending somebody else’s money, it’s hard to see why they’d be shy or apologetic about gaining commercial value from it. Does CommunityForce create value for NatWest? Probably not much. It appears to have been designed for PR, though many people complained about the technology platform used for the voting, and it’s hard to imagine that the 93% of rejected charities were delighted by the experience. Corporate philanthropy schemes are often designed for PR and ‘brand building’. But they’re patently not essential for building brands: people left candles and flowers outsides Apple stores around the world as tributes after the passing of Steve Jobs – under whose leadership, his company, beloved of so many, gave barely a pip to charity. It’s even been criticised for making it difficult for customers to donate to charity through its phones and other products[iii]. At a more sophisticated level, a company’s giving may create value by bringing about a social change which is beneficial for the company. The Coca-Cola Company in Africa used the trucks and network which form its legendary logistical operation to combat the spread of HIV and AIDS. It distributed condoms and attractive informational materials to all those dusty villages in the back of beyond where, astonishingly, you can always get a Coke. Not just serving a major need, but creating value for the company because, by 2002, Coca-Cola was Africa’s largest private sector employer and stood to lose a great deal by declining physical and economic health of the population[iv]. You probably didn’t know about this: there wasn’t a massive PR campaign about this work in ‘the West’ because the goal wasn’t reputation but rather keeping staff and customers alive in Africa. ‘The acid test of good corporate philanthropy is whether the desired social change is so beneficial to the company that the organisation would pursue the change even if no-one ever knew about it,’ say Mark Kramer and Harvard Business School Professor Michael Porter[v]. (2) If the giving achieves more than individual shareholders could achieve themselves. After all, shareholders put commercial money into the company to achieve a financial return which they could not achieve themselves. Corporations meet this criterion if they deploy their unique sets of assets and market positioning in some useful way which only that company could do. Hence giving should relate deeply to a company’s strategy. Dishing out cash rarely meets this criterion. Goldman Sachs has skills in structuring bonds, whereas its shareholders collectively don’t, so that meets the test. Similarly Coca-Cola has trucks all over Africa, whereas its shareholders don’t, so it is well-positioned to distribute condoms. Because the owners of private companies are not beholden to external shareholders, they can choose whether they mind if their giving creates commercial value for the company or not. However, their philanthropy is still most effective if it uses the company’s unique assets in a strategic manner. What about companies giving money to charity? Straightaway it’s clear that simply looking at how much they give (whether money or staff time or anything else) indicates nothing. It’s a measure of input, and, like most measures of input, is irrelevant to impact. There once were rankings of companies based on how much cash they gave, which mercifully have disappeared now: not only did they ignore non-cash donations but simply looking at what is given indicates nothing about what is achieved. From the analysis above, you may have figured that I’m sceptical about corporations giving solely money. If ‘money is the least valuable social change asset’ and companies have a dazzling array of more valuable assets they can deploy, why are they giving money at all? Is that really the best option they can think of? Going back to our NatWest example, what’s really wrong with that? The missed opportunity, that’s what. The resources which it gives could deliver so much more. People miss out because these resources are given in the wrong way. Even if it reaches effective charities, money alone is much less valuable than other resources which could be given at the same cost. We’re supposed to applaud the generosity of programmes like this (though it’s giving somebody else’s money) but in fact we should deplore its carelessness. Perhaps this is harsh. Perhaps it’s enough to look at whether the charities are effective. I don’t think so: we should always strive for our giving to achieve not just something but everything possible. Goldman Sachs could have made money from those bankers’ time and simply given it to the vaccine programme, but it would never have created anything like the impact of the bond. Intrepid Travel could have supported an effective charity anywhere. But by supporting a village from which it draws guides, it not only does work worthwhile in its own right, but enhances the customer experience which is good for the company, makes more revenue available for good works in future, and hence makes it easier to continue. 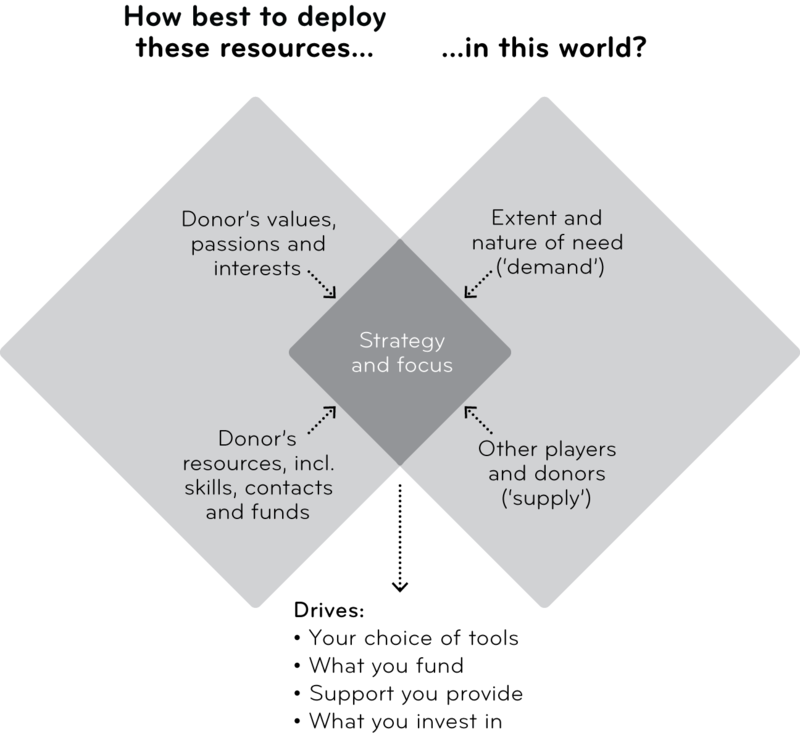 The trick with corporate giving is finding the intersection in the diagram above, where the company can best help for least effort, and creating benefit for itself which makes the giving defensible and sustainable. Because in terms of impact for the company and for beneficiaries, it ain’t what you give, it’s the way that you give it. Along with Gap, American Express, Starbucks and others, Apple has product in the (RED) range, created by U2 frontman Bono, a portion of the revenue of which goes to the Global Fund to Fight AIDS, Tuberculosis and Malaria. For most (RED) products, the companies state the portion donated to the Global Fund. For the (RED) iPod, Apple does not disclose the amount it donates. Hmm. quote from Michael Sherwood www.gavialliance.org/vision/in_financing/iffim/iffi_capital_markets_view.php, all accessed 11 August 2011. [ii] ‘The bond itself is credited with saving at least 3m lives’: Gavi Alliance, 2011, ‘Innovative Finance’, www.gavialliance.org/funding/how-gavi-is-funded/innovative-finance/, accessed 28 November 2011. [iii] Apple’s philanthropy: Carry, J. and Martin, C. E., 2011, ‘Apple’s philanthropy needs a reboot’, CNN Opinion, http://bit.ly/tHZqiN, accessed 5 October 2011. [iv] ‘The Coca-Cola Company in Africa; Leveraging Core Competencies to Combat HIV/AIDS in Africa’, Case Western Reserve University, worldinquiry.case.edu/bankGetFile.cfm?idFile=328, accessed 21 October 2011. [v] ‘The acid test of good corporate philanthropy’: Kramer and Porter, ‘Strategy and Society: The Link Between Competitive Advantage and Corporate Social Responsibility’. This entry was posted in Corporate philanthropy, Effective giving. Bookmark the permalink.